Amazon Price: $49.99 $49.99 (as of 18th April 2019 1:19 am – Details). Product prices and availability are accurate as of the date/time indicated and are subject to change. Any price and availability information displayed on the Amazon site at the time of purchase will apply to the purchase of this product. Kids love to race and there are hundreds of great motion-controlled racing apps to play, but tilting an iPad around just isn't as comfortable or fun as actually turning a real wheel. 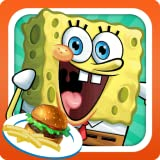 With the SpongeBob SquarePants Inflatable Car for iPad from CTA Digital kids can hop in and feel like they're really driving! The steering wheel cradle is especially designed to hold and protect the iPad so kids can play and pretend to drift and race to first place. Watch them maneuver through virtual obstacles and speed through racetracks in this fun SpongeBob themed kart. Ahoy mateys! Are you ready? The super bouncy and comfortable seat is designed for a child and supports up to 230 lbs. so drivers of all ages can enjoy playing their favorite racing game. The car is also very easy to set up–just pull out and pop open the air valves around the car and inflate each section with the included foot pump. Hop in the seat and go with the official licensed Nickelodeon SpongeBob SquarePants Inflatable Sports Car for iPad by CTA Digital. The steering wheel is compatible with iPad 2 and the new iPad. The iPad is locked into the wheel with a latch so it will not fall out while playing and sits securely in the center of the wheel, which features grips on each side for comfortable control. Easily connect the wheel to the Inflatable car mount and jump in the bucket seat for a realistic racing feel. The Inflatable Car is strong and durable, with a comfortable seat that's safe for children, supporting up to 230 lbs. It's made of inflatable material that's rated for indoor use, and measures 45" x 28". The car is also very easy to set up–simply pull out and pop open the air valves around the car and inflate each section with the included foot pump or an electric air pump. The car can just as easily be deflated with the pump and stored away for later use. The steering wheel is compatible with many popular iOS motion-controlled racing titles for the iPad, including Sonic & SEGA All-Stars Racing HD, Shrek Kart HD, Crash Bandicoot Nitro Kart 3D, Cocoto Kart HD, Krazy Kart Racing, KartRider Rush, Asphalt 6: Adrenaline HD, Real Racing 2 HD, Let's Go Karting, and many other racing game apps. 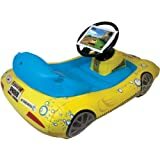 CTA Digital Inflatable Car with plastic steering wheel cradle for iPad, foot pump.